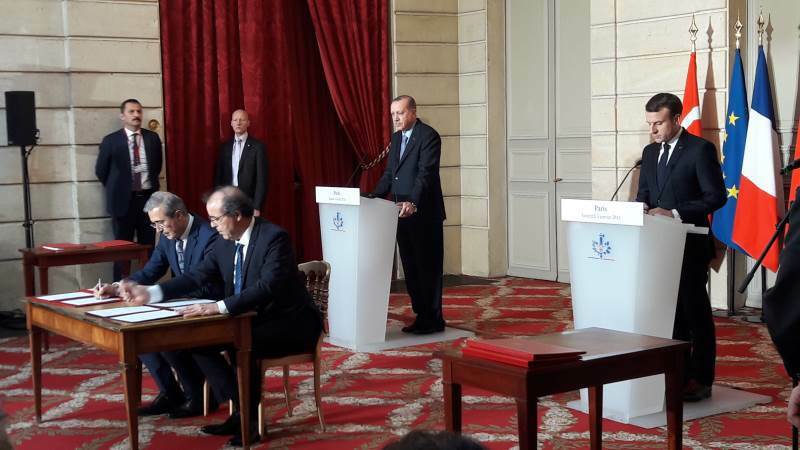 Contrary to what Turkey claims, France and Italy agreed to supply their SAMP/T air-defense system, and agreed to help Turkey develop a next-gen air defense program, whose contract signature in Paris is pictured here. ISTANBUL --- Turkey’s strategic goal of developing a domestic arms industry is a driving force behind its intention to buy Russia’s S-400 missile system, with Moscow including technology transfer as part of the deal. The technology transfer offer, analysts say, is impeding Washington's effort to persuade Ankara to buy the U.S. Patriot missile system instead. However, Turkish Foreign Minister Mevlut Cavusoglu and a senior presidential advisor, speaking anonymously, both insist the multi-billion-dollar S-400 purchase would go ahead. Although Cavusoglu suggested Ankara could also purchase the Patriot system. Some observers say Ankara’s decision to turn to Moscow for arms is a result of Turkey’s allies failing to share their technology. “Russian provides the best option,” said International Relations Professor Huseyin Bagci of Ankara’s Middle East Technology University. Ankara cites Washington's reluctance to allow technology sharing and co-production for the breakdown of earlier talks to purchase the Patriot System. The collapse of those talks saw Ankara first considering a Chinese system and then ultimately favoring the S-400. In the latest U.S. diplomatic effort to stop the S-400 purchase, Assistant Secretary of Defense Kevin Fahey told reporters this week Washington could be more flexible. "Turkey has had an interest in Patriot, so we've been working for a while on how we can make that work," he said. However, analysts say Ankara is aware any Patriot missile deal would have to be signed off by Congress, which is increasingly taking an assertive stance toward Turkey. U.S. lawmakers are already threatening to block the delivery of American F-35 fighter jets. In the past, many Turkish arms deals have been stopped or delayed by Congress. Political analyst Atilla Yesilada of Global Source Partners points out the questionable reliability of Turkey’s Western allies in supplying arms is the impetus for Ankara to expand its own armament industry. “Any foreign partner who supplies weapons and has any qualms at the way we fight could withhold new ammunition or new weapons, and this kind of blackmail or veto Turkey cannot afford, no country can afford this. That's why domestication of the defense industry is a good thing.” Yesilada said. Turkey’s recent military operations against Kurdish insurgents in neighboring Syria and Iraq were a showcase for Turkish-produced weapons. “Almost all of the armored carriers operating in Afrin (Syria) are domestically produced. I thank our friends who produced them,” said Turkish President Recep Tayyip Erdogan in February. Turkish-produced armed drones also now play a key role in Turkish military activity. This week Turkey confirmed the sale of 30 attack helicopters and four corvette warships to Pakistan. A Western diplomat speaking anonymously said concerns over whom Ankara would share technology that it secured from its allies is a likely factor behind the reluctance to include technology transfer in arms deals. A deal between Ankara and British engine-maker Rolls Royce to develop a fighter jet has reportedly run into complications over shared technology. However, high-end technology transfer is critical a goal for Ankara in developing its arms industry. “Turkey does not have the high technology; Turkey is still in need of technology for jet engines and engines of tanks. Turkey intends to have a much bigger and sophisticated defense sector,” professor Bagci said. Moscow too has limits on sharing technology with Ankara. Russian President Vladimir Putin reportedly politely rejected overtures by Erdogan to upgrade Turkey’s S-400 purchase to Russia’s latest S-500 system. But analysts suggest Moscow will continue to offer just enough technology to exploit the West's reluctance to share its technology with its Turkish ally. (EDITOR’S NOTE: While Turkey needs to find a justification for its decision to buy the S-400 Russian air-defense system, its explanation that its allies have refused to transfer technology is disingenuous, at the very least.